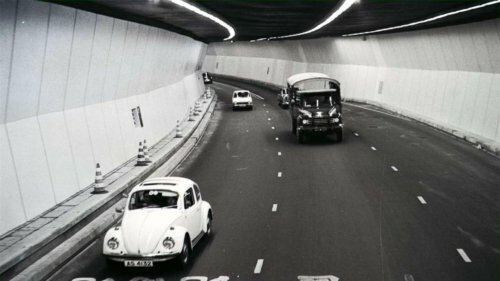 Tymon Mellor: Within the first 15 minutes of the opening of the Cross-Harbour Tunnel on the 3rd August, 1972 over 700 vehicles had driven through the tunnel, signalling the future success of the project and allowing the tunnel to become part of the Hong Kong DNA. But from the outset, construction of this new icon had many hurdles to overcome including; riots, doubts about the traffic forecasts, and the death of two workers. 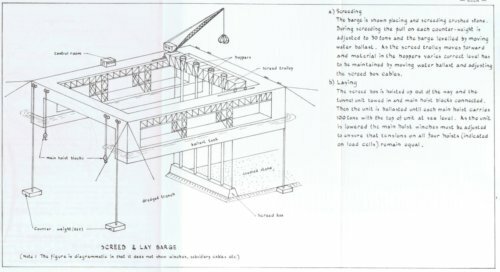 As described in Part 1 of this article, linked below, the harbour crossing was originally conceived as a bridge, with planning commencing in the 1950’s. But following strong objections, primarily on the grounds of the envisaged impact to the Kai Tak Airport, a tunnel solution was adopted for the link between Causeway Bay and Hung Hom. With the approval of a Legco bill to offer a 30 year franchise to ‘The Victoria City Development Company’ in 1965, work could commence on the project. In April, 1965 The Victoria City Development Company founded ‘The Cross-Harbour Tunnel Company Ltd’ to own and implement the project. 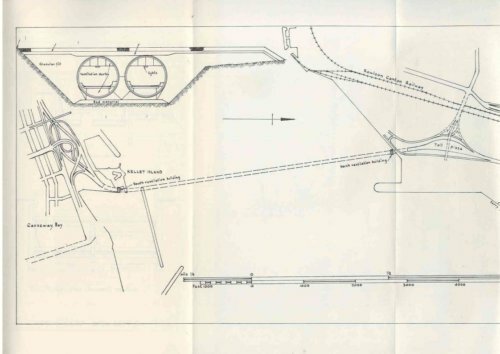 The detailed design of the tunnel was undertaken by Scott Wilson Kirkpatrick & Partners with support by Freeman Fox and Partners and by October 1966, tenders were invited for the scheme with the tenderers invited to provide a technical and financial proposal. The successful tenderer was a consortium led by Costain International Ltd of London, supported by Raymond International Incorporated of New York and Paul Y Construction Co Ltd of Hong Kong. 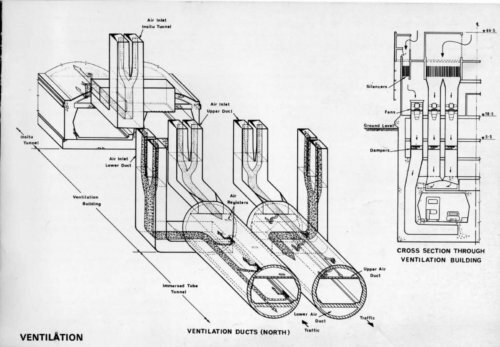 The consortium’s tender, submitted in February 1967, was based on an alternative steel tube design for the twin traffic ducts, prepared by Parsons, Brinckerhoff, Quade & Douglas of New York. This design had considerable British ‘export content’ in the steel plating and enabled the consortium to offer attractive terms for deferred payment through a loan from Lloyds Bank of London, backed by an Export Credits Guarantee from the UK’s Board of Trade. 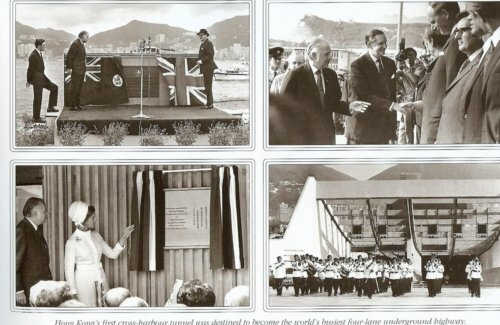 Negotiations with the consortium were suspended in the middle of 1967 due to the financial uncertainties arising from the Hong Kong summer riots, and little work was carried out on the project during the next eighteen months. However, the HK Government commenced construction on Hong Kong Island of the new roads and junctions which would be required, whether or not the tunnel was built. The contract for extending Bowrington Canal across Wanchai Reclamation was let in August 1967, while work on Canal Road Flyover started in March 1968 and on Chatham Road Flyover in April 1968. Towards the end of 1968 interest in the tunnel revived, and by March 1969 negotiations had been reopened with the consortium who obtained from Lloyds Bank the offer of a loan of £14.75 million, repayable within seven years of completion of the tunnel. 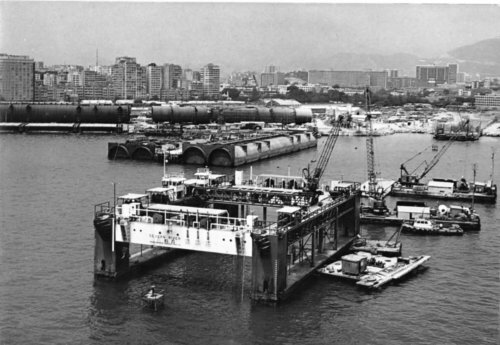 A construction contract for HK$272,533,333 was signed with The Cross Harbour Tunnel Company on 26th June, 1969 and work commenced at Hung Hom on the 1,855m long tunnel on 3rd September, 1969. 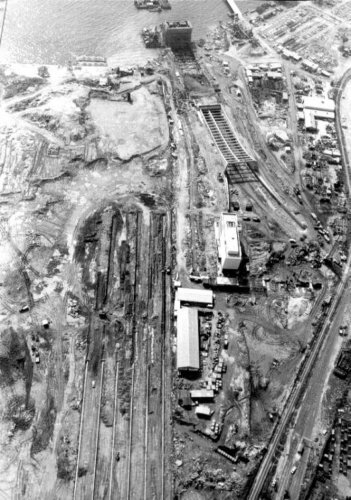 Meanwhile, work had started on the extension to the Canal Road Flyover in April 1969 and as soon as it was certain that the tunnel was going ahead, work on the remainder of the connections was implemented. 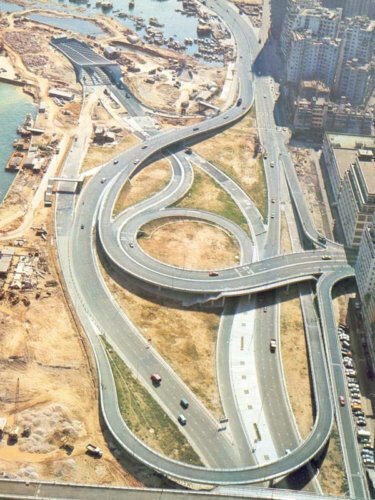 Work started on the Kowloon connections in March, 1970. By June 1972 all road connections were completed and ready to take traffic to and from the tunnel. There are two general forms of immersed tube tunnel commonly adopted around the world, a reinforced concrete structure, as favoured by European designers, and steel tubes surrounded in concrete for protection and ballast, which was popular in the United States of America. The latter was proposed by the winning contractor as the units could be fabricated adjacent to the site, without the need for a casting basin that could be later flooded. A fabrication yard was established on the new Hung Hom Reclamation where the steel sheets were assembled into circular sections and welded into the immersed tubes. The tunnel units consisted of twin 10.3m diameter steel tubes set at 11.8m centres and varying in length between 98.7m and 113m. The tubes were stiffened by diaphragms at 5.1m intervals and had temporary bulkheads at each end to temporarily seal the units. A total of 15 units were required, with eleven straight and four mitred to accommodate changes in slope or direction. A total of 15,000t of steel was required, all shipped from the UK as plate steel to be welded into shape on site. The yard was designed to produce a 1,000t unit every four weeks. 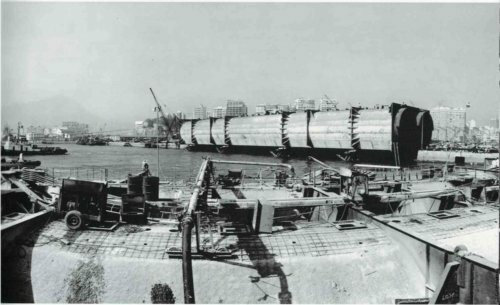 Once fabricated, the concrete keel and temporary bulkheads were installed before the units, now 6,000t each, were launched sideways into the sea, in the same way ships are sometimes launched. The units were then moored against a temporary pier for the installation of the internal concrete, final fitout and completion of the concrete covering, bringing the final weight to 30,000t per unit. With bulkheads in place at the end of the units, the steel tubes had positive buoyancy and could be floated around within the harbour. 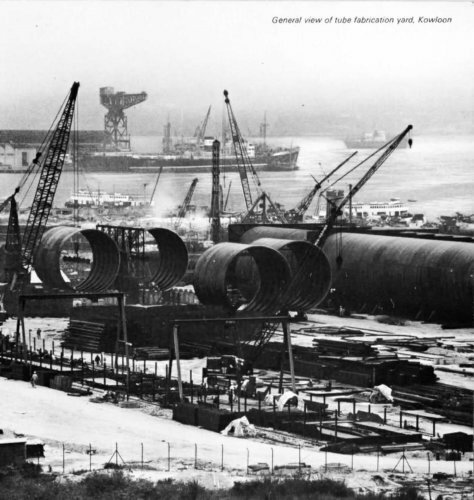 The first unit was positioned on the Kowloon side after the ventilation building had been constructed and the tunnel was extended across the harbour to Hong Kong Island. Before the units could be installed, the sea bed had to be dredged to form a trench and 600mm of crushed stone bedding material placed using a purpose built screed and laying barge. Alignment was maintained using a laser beam guiding the units into place before being lowered 21m into the prepared trench. Each tube section had a projecting plate or hood at the end of each unit. These were offered up to the matching plates of the unit already in place and attached by inserting tapered pins through register plates on both units. 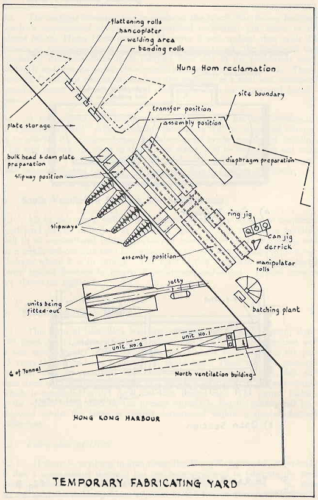 The gap between the over lapping plates was caulked and curved closure plates driven to form a coffer-dam around the junction .The space between the steel tubes and around them was then filled with tremie concrete. Working from inside the completed section of the tunnel, the space between the dam plates was then drained and the two plates cut away. Steel plates were then welded in to make the steel tubes continuous and any cavity behind the closing rings grouted up. Finally, reinforcement was fixed across the gap and the internal concrete infill completed. Around the completed unit, the trench was then backfilled and a course stone blanket placed on top. 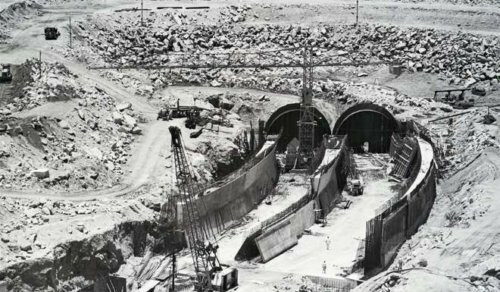 Installation of the first unit was laid on the 29th December, 1972 and the last immersed tube unit was completed in February, 1972, and on the 3rd August, 1972, one month ahead of the scheduled completion date, the tunnel was opened to traffic. The two ventilation buildings, one on either side of the harbour each contained an overall total of ten axial flow fans and connects to the 100m louvered portal designed to provide a gradual transition between tunnel lighting and day light. Both approaches to the tunnel and the ventilation buildings were constructed in reinforced concrete. On the Kowloon side, excavation for the approach ramp was made within bored pile retaining walls supported by temporary steel and permanent concrete struts and beams. On the Island side, the ramp and ventilation building were constructed in-situ behind an earth and rockfill bund. The northern ventilation building was constructed as a steel and reinforced concrete caisson that was floated into position and sunk on to a prepared foundation of crushed stone. It was built in Taikoo Dockyard and part of its internal sub-structure was completed after launching, but prior to sinking. After it had been founded on the stone bed, the remainder of the sub-structure was built, followed by the superstructure. The tunnel plant and equipment had an electrical demand of around 4.5MWA, drawn from HKE and CLP with an emergency 25kW diesel generator for essential services in the event of both supplies failing. The major power demand were the ten large 2m diameter fans that operate a semi-transverse ventilation system delivering 73,600m3/min of air. Fresh air was introduced into the tunnel through ducts in the kerbs and ceiling, and exhausted through the portals. Continuous air quality monitoring was implemented to ensure that the levels of carbon monoxide did not breach allowable limits. Lighting was provided with continuous florescent tubes within the tunnel and graduated lighting at portals to provide a transition with the external natural lighting conditions during day time. Within the tunnels, close circuit TV was introduced along with traffic control, fire alarms, a hydrant system and a drainage system. The electrical and mechanical systems along with the sophisticated tunnel control systems of that time were managed by NV Philips Gloeilampenfabrieken, or Philips as they are now known. The tunnel was formally opened on the 21st October, 1972 by Her Royal Highness The Princess Alexandra, sporting a nice white hat. In the first full month of operation, September, 1972 the average number of vehicles passing through the tunnel each day was 22,000 on weekdays, and 30,000 on Sundays. Over the years, the traffic increased and the average daily vehicle flow through the Cross Harbour Tunnel peaked at around 123,000 in 2006 but it has since dropped to around 115 000. This is impressive given the design capacity of the tunnel is only 80,000 vehicles a day. This is even more foresighted given that the traffic forecasts in the 1960’s indicated that the volume of traffic that would use the tunnel only required a single lane in each direction. However, the forecast was wrong and within three and a half years from opening, the toll revenue was more than sufficient to pay back the construction costs. Until the Eastern Harbour Tunnel was opened in 1989, it remained the only physical connection between Hong Kong Island and Kowloon. It is now hard to believe that the Government of the day thought it would not be a commercial success. 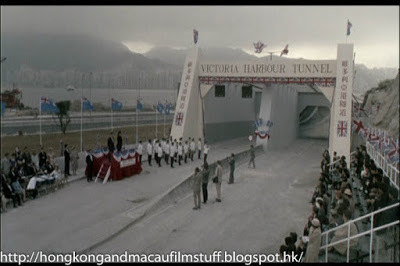 In popular culture the Cross Harbour Tunnel has not paid much of a role. 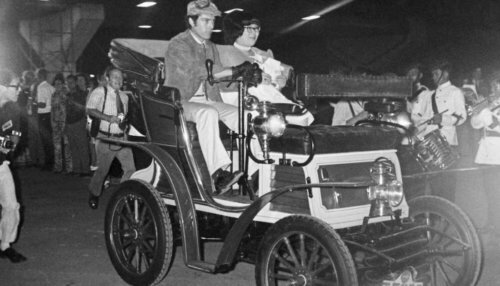 However, Hong Kong entertainment icon ‘Fei-fei’ (Lydia Shum Din-ha) was ceremoniously driven through the tunnel on opening day in vintage fashion. The tunnel opening ceremony was re-staged for the 1991 Jean Claude Van Damme film, Double Impact in the opening sequence of the movie. The set was re-created in Yau Tong with timber and paint. This article was first posted on 23rd January 2017.